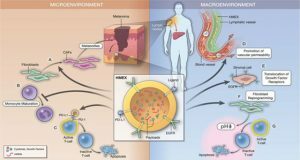 Extracellular vesicles (EVs) are actively secreted, membrane-bound communication vehicles that exchange biomolecules between cells. 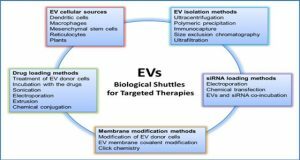 EVs also serve as dissemination vehicles for pathogens, including prions, proteinaceous infectious agents that cause transmissible spongiform encephalopathies (TSEs) in mammals. Increasing evidence accumulates that diverse protein aggregates associated with common neurodegenerative diseases are packaged into EVs as well. Vesicle-mediated intercellular transmission of protein aggregates can induce aggregation of homotypic proteins in acceptor cells and might thereby contribute to disease progression. Our knowledge of how protein aggregates are sorted into EVs and how these vesicles adhere to and fuse with target cells is limited. Here researchers from the German Center for Neurodegenerative Diseases review how TSE prions exploit EVs for intercellular transmission and compare this to the transmission behavior of self-templating cytosolic protein aggregates derived from the yeast prion domain Sup 35 NM. 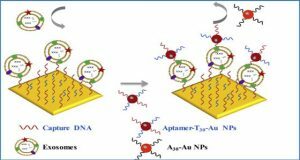 Artificial NM prions are non-toxic to mammalian cell cultures and do not cause loss-of-function phenotypes. Importantly, NM particles are also secreted in association with exosomes that horizontally transmit the prion phenotype to naive bystander cells, a process that can be monitored with high accuracy by automated high throughput confocal microscopy. The high abundance of mammalian proteins with amino acid stretches compositionally similar to yeast prion domains makes the NM cell model an attractive model to study self-templating and dissemination properties of proteins with prion-like domains in the mammalian context. (A) Cell culture assays to study exosome-mediated TSE prion infection. 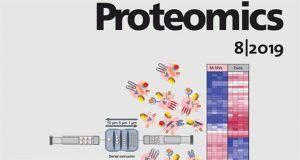 Published exosome-mediated TSE infection assays are time consuming und rely on the detection of newly formed, proteinase K (PK) resistant PrPSc. Naive cells permissive to infection with the respective TSE prion strain are exposed to exosomal preparations isolated from prion-infected cells for 4–5 days, followed by several weeks of culture. 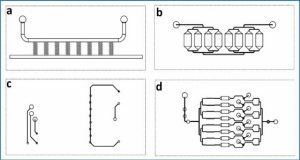 Read-out is PK-resistant PrPSc detected by cell blot or western blot. (B) Quantitative imaging of exosome-mediated NM aggregate induction. Recipient NM-GFPsol cells are seeded on a 384 well plate for 1 hour. Exosomes isolated from conditioned medium of donor cells are added to the wells. Life or fixed cells are subjected to automated high throughput confocal microscopy. Read-out is induction of NM-GFP aggregates in recipient cells. 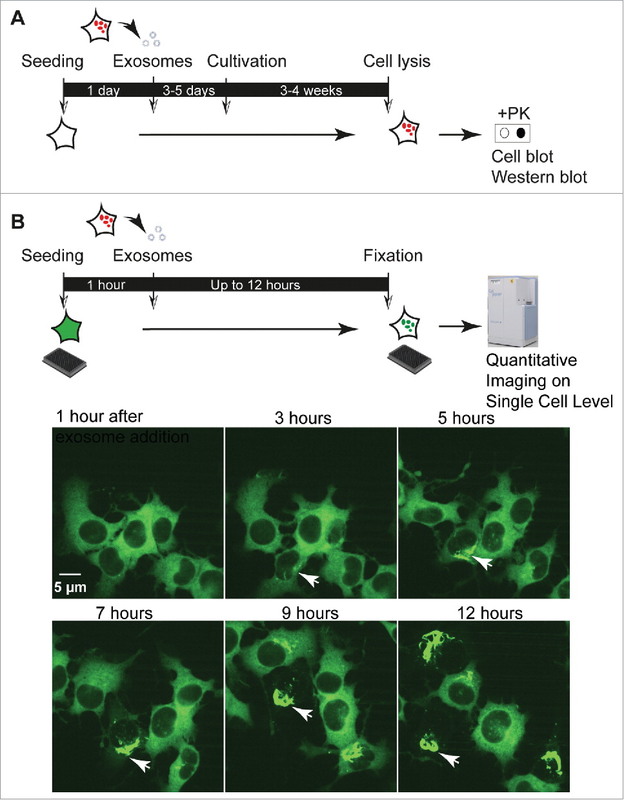 Life imaging analysis demonstrates the appearance of NM-GFP aggregates as soon as 3 hours post exosome addition. The arrowhead marks cells with exosome-induced NM-GFP aggregates. The assay can also reveal bidirectional inheritance of NM aggregates by daughter cells, a characteristic of TSE prions replicating in cellular models.